The holiday season is quickly approaching. There is a chill in the air that bites your nose when you wake up early in the morning. Soon it will be time to ditch those pumpkins and bring in the tree! While you are staying at Cabin Creekwood, premier cabin rentals in Virginia, why don’t you visit some of the many tree farms we have in the area? These tree farms are choose and cut, and at some you have the option to choose and have the trees cut for you. Several of these are located off the Blue Ridge Parkway, giving you the opportunity for a little extra exploration while you’re out. You can find these tree farms near our cabin rentals in Virginia, in Augusta County: Boy’s Home (Tannehill) Christmas Tree Farm, Chuttum Tree Farm, Francisco Farms, Garman Christmas Trees, Long Meadow Tree Farm, and Turk Mountain Tree Farm. All provide saws, and we heard that sometimes Santa Clause shows up at Long Meadow Tree Farm, a great little treat for the kids. Since we are located in the beautiful Shenandoah Valley, we are surrounded by big gorgeous mountains. Nelson County also borders our location in Augusta County. In Nelson County youw ill find: Cub Creek Farm, Davis Creek Christmas Tree Farm, Fox Hill Farm, Kris Kringle’s Tree Farm, Ralph’s Christmas Trees, and Skylark Christmas Tree Farm. Again, these are all choose and cut, however, there are options in that area for pre-cut Christmas trees as well. 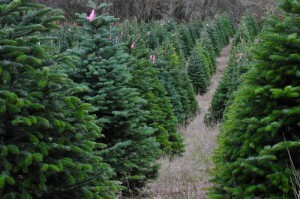 We hope you come and visit us at Cabin Creekwood near the holiday season and choose to go pick a tree with the family. It is a great adventure and we know you will love it. Call us to make your reservation today!